Left-click to generate a new one. Right-click to move it to main view. Shift + left-click to backtrack. Each of the four templates have slightly different attributes (i.e. 2 and 4 are split into two islands). Inverts the terrain in the main view (i.e. open spaces becomes land and vice versa). Controls the number of bridges that will be created on your map. The numbers do not actually correspond; it's more of a sliding scale. The '10' setting won't actually produce 10 bridges, but it will produce the maximum number. '0' will prevent any bridges appearing. Left-clicking this button will toggle the map in the main view between draw mode and preview mode. In preview mode, the map will be shown with terrain texture, etc. In preview mode, you can click the "Reseed" button to change the arrangement of terrain objects (holding shift while pressing Reseed will backtrack). Left-click to create random tunnels in your map. Right-click to create random lines of land instead. Controls the number of terrain objects that will be created on your map. The numbers do not actually correspond; it's more of a sliding scale. The '10' setting won't actually produce 10 terrain objects, but it will produce the maximum number. '0' will prevent any terrain objects appearing. Click this to import a bitmap from your Worms Armageddon/User/Import/ folder. Left-click to add a random arrangement of randomly-sized solid circles of land to your map. Right-click to make holes instead. Left clicking this button will toggle between full-perimeter border. Right-clicking will add a border to the top of the map but not the sides (thus switching the map into a cavern). Left-click to set the initial water level. Right-clicking will set the water at a level for "water drops", whereby weapons and objects will sink, but worms will not. Only applies when the full-perimeter border is on. Click the brush button (or use the mousewheel) to cycle through brush sizes, and click the map to add or subtract terrain (by left or right-clicking respectively). To draw straight lines between two or more points, hold down SHIFT and click those points. To draw perfectly horizontal or vertical lines, hold down CTRL while drawing. For increased precision, the stroke speed can be lowered by holding ALT while drawing. Left-click an empty space in your map to fill it up with solid land. Left-click to blank the entire map. 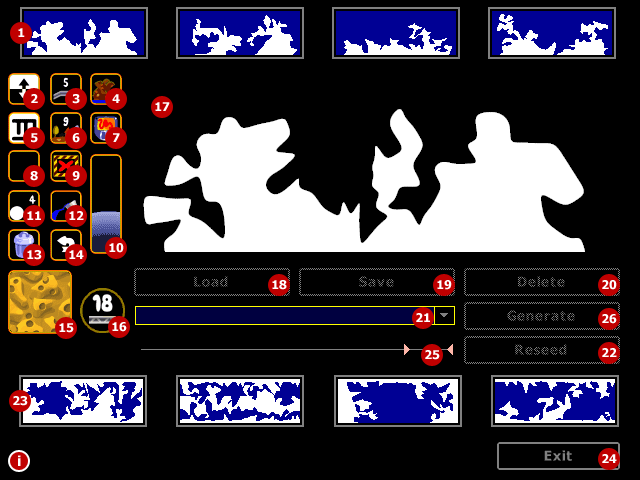 Right-click to fill the entire map with solid land. Left-click or right-click to cycle through the terrain textures. Some terrain textures experience 'thinning' with version 3.0. To toggle this effect, hold CTRL while clicking the this button. It is helpful to do this while in Preview mode. The texture-thinning property is saved along with the map. Holes are placed when there is no room on the map for all the worms. The number of holes can be changed by clicking the this button. Holding Shift while clicking or right-clicking will fine-tune the value. The Reseed button can be used to cycle through different hole arrangements. Loads the map in the drop-down box to the main view. Saves the map in the main view, with whatever name has been typed into the drop-down box. You may be asked to over-write. Deletes the map in the drop-down box. Lists all maps saved in Worms Armageddon/User/SavedLevels/. Maps can be organised into folders. When in preview mode, this will regenerate the map with a new arrangement of bridges, terrain objects, and worm placement holes. Left-click to generate a new one. Right-click to move it to main view. Each of the four templates have slightly different attributes (#1 is an enclosed cave; #2 is a dual-layer cave; #3 is open to the water, #4 is open to the edges of the map).